Remember Bazooka bubble gum, Ring Pops, and Push Pops? 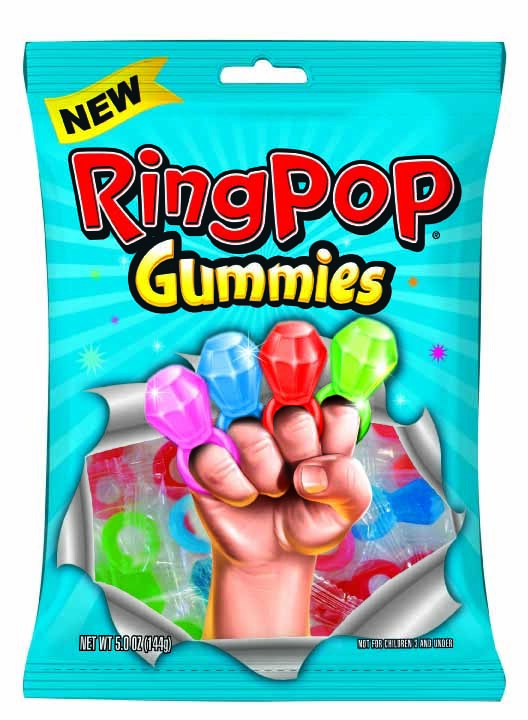 Well, Bazooka Candy Brands recently introduced Ring Pop Gummies, which is pretty much the gummy version of the edible Ring Pops. The original Ring Pop made its debut 35 years ago and this month, the gummy version hit stores nationwide. The Gummies are available in 1.7 oz pouches and 5 oz bags with a suggested retail price of $1.19 and $2.29, respectively. The candy is available in four classic Ring Pop flavors including Strawberry, Cherry, Watermelon and Blue Raspberry. Do you plan on trying it? The ring pop are sweet wow!